Several archaeological sites and famous noble palaces of Rome can be visited requesting and reserving the opening in advance. We are proposing here a few of the most interesting. Here laid the bodies of the most important members of the family that destroyed Carthage like Scipio the Asaticus, brother of the Africanus and Scipio Emilianus. This jewel of the Archaic Roman funerary art was built by the founder of the family, L. Cornelius Scipio Barbato whose sarcophagus of granite, shaped as an altar and dated to 280 BC, was placed in front of the entrance. The last burials date back to the middle of the II century BC, when a collateral branch of the Scipios decided to extend the grave, excavating a new side tunnel and constructing a monumental facade. The burial formed by galleries that intersect each other at right angles, was carved into the rock of the hill. It contained 30 sarcophags placed along the wall, some directly made on the spot. Here were buried Scipio the Asaticus and Scipio Emilianus, enemies of the Carthaginean Hannibal and destroyers of Carthage. In the archaeological area are also found a perfectly preserved underground columbarium and the remains of a late Roman house. Though small in size, it is very significant due to its beautiful paintings and its exceptional state of preservation. 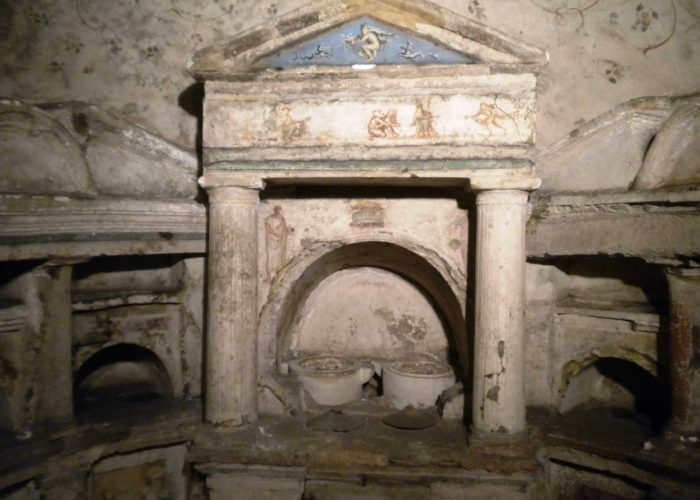 The columbarium of Pomponius Hylas, located between the Appian Way and the Aurelian Walls, was discovered in 1831. Its construction dates back to the first half of the I cent. AD and continued to be used until the II. On the wall in front of the entrance steps an inscription shows the names of Pomponius Hylas and his wife. At the bottom of the stairs opens an underground room. Vine shoots, birds and cupids are painted on the vault. Two subjects, who probably were the founders of the tomb, are depicted in the aedicule at the bottom of the apse, formed by two small columns, a frieze and a tympanum. On the other walls of the columbarium there are smaller niches, with scenes of Orpheus, Hercules and Achilles. 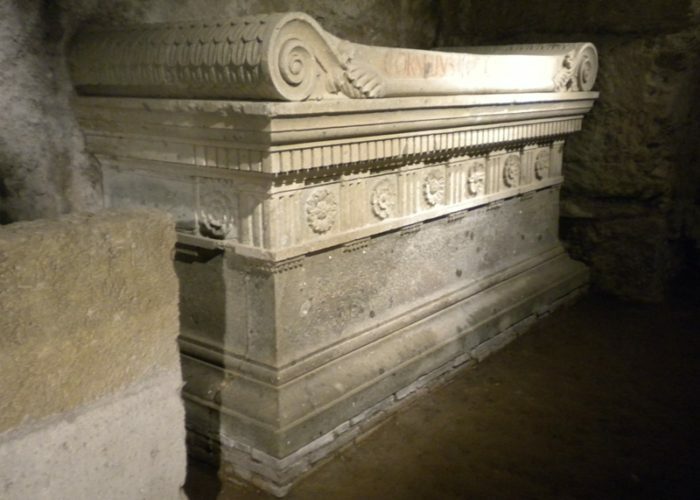 The perfectly preserved body of a woman was found in a sarcophagus under the floor, but it immediately turned into dust as the sarcophagus was opened. 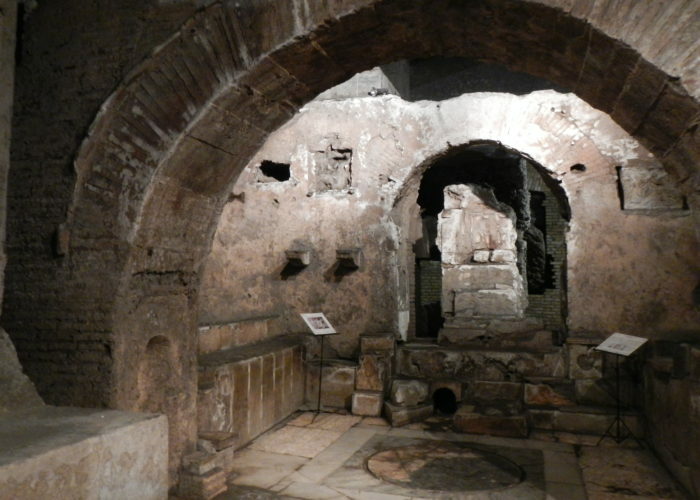 Built in the II century in the basement of a building adjacent to the Circus Maximus, the Mithreum consisted of various rooms preceding the actual sanctuary, the spelaeum or cave where the faithful came in contact with the god after overcoming various degrees of initiation. Central act of the myth was the killing of the cosmic bull who, dying, gives life to the universe so as represented on the big marble relief here dedicated by “Hermes Tiberius Claudius “. The initiates, from whom the women were excluded , celebrated a sacrifice and ate the victim together in honor of the god. Climbing the hill of Testaccio literally means walking on shards: loops, edges and bottoms are everywhere, while the jars layers are clearly visible on the slopes. Since the republican age the Emporium was the landing point of goods and raw materials (marble, corn, wine and oil ) arriving by sea to the port of Ostia and sailing up the river on barges to reach the endless lines of warehouses along the Tiber. Over the centuries, the pieces of the oil jars that, due to the type of food contained, could not be reused, were neatly piled on each other, to form an artificial mound behind the port: the Mons Testaceus, was formed of 35 meters of broken oil amphorae, mostly from Spain, accumulated over the centuries. A walk following what survives of the ancient warehouses will lead us from Mount Testaccio to the ruins of the Roman port on the Tiber. Other sites may be available on request. 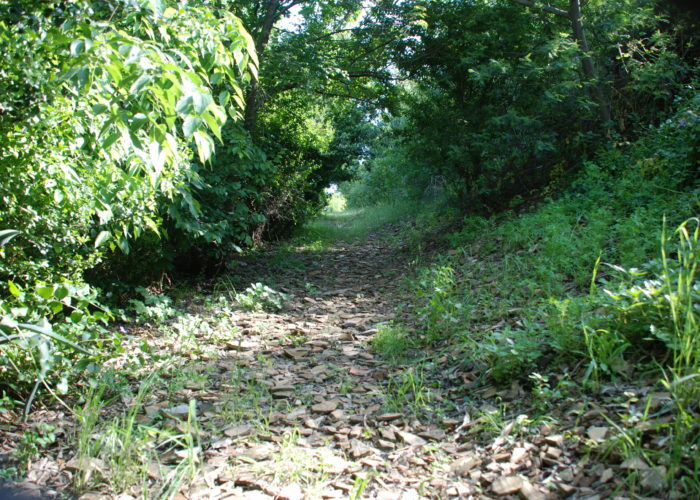 Please specify in which visit you are interested in your message. Thank you!